Need a prominent display that does not occupy any floor space? 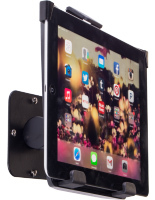 These iPad Air wall mounts will affix to any vertical surface, while some can also sit on tabletops. Storeowners won’t have to give up valuable floor or counter space just to place theese merchandisers. iPad Air wall mounts are great for retail stores, museums, schools and electronics outlets because they allow for public tablet use. Each can be used to showcase a digital catalog, interactive exhibit, educational activity or a merchandise demonstration. 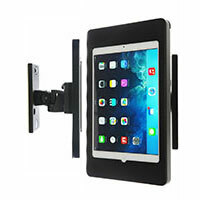 iPad Air wall mounts, or mounted touchscreen brackets, will attract visitors while keeping their attention with slideshows, videos and captivating apps. This type of fixture comes in a number of styles for different applications. What different features are available with these touchscreen holders? 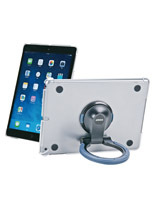 iPad Air wall mounts can come with a ring that allows them to hang on vertical surfaces or stand on countertops. This allows them to easily convert between different placement options. Each of the bracket’s easel ring can also fold up to make it easy to use them on the go. These wall mounts can also be affixed to vertical surfaces with the use of screws and mounting hardware. 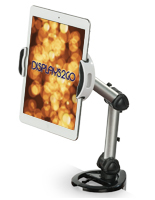 This type of fixture creates a stable grip that makes touchscreens easy to use. 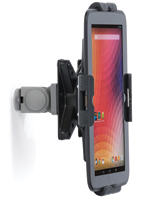 In addition, they have an adjustable bracket that can rotate and tilt for horizontal or vertical display. Users can change the direction these enclosures face to accommodate any stature. For additional security, wall mounts are available with a locking case that makes them resistant to theft. Each fixture has an aluminum or steel construction and locks with a key to ensure that they cannot be broken into. Some of the holders have a movable bracket that can accommodate different tablets. 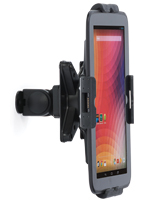 These useful mounts can fit generation 1, 2, 3, 4 and Mini Apple® devices and Android models that measure 7” or 10” wide. Each mount features a sturdy fabrication of plastic, aluminum or steel that protects electronics from falling when on display. In addition, the holders feature a neutral finish of black, clear, gray or blue that will complement any décor. Cases minimize the amount of space they obscure on the device and most expose the home button, which would allow users to navigate to other apps. Some models feature an adjustable cover that obscures it, and would be useful for storeowners that want to keep customers in one application. Fixtures like these can be used by restaurants to display interactive menus and sign in sheets. 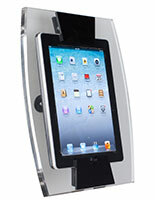 Retail outlets can use them for showcasing digital catalogs, or to advertise the device itself. In schools and colleges, teachers can use them for displaying educational activities. Museums might use the cases to show slideshows, videos and apps that accompany exhibits with additional information. 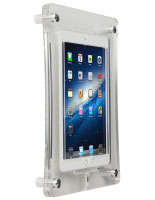 Order one online from iPadHolders2go.com for wholesale pricing and same day shipping!